For those unfamiliar with this beast, it's part of Buffalo Trace's "Antique Collection". an annual collection of limited releases typically aged longer than the standard Buffalo Trace releases. Highly sought-after, the "BTAC" releases often sell out in a matter of days upon release in the US. 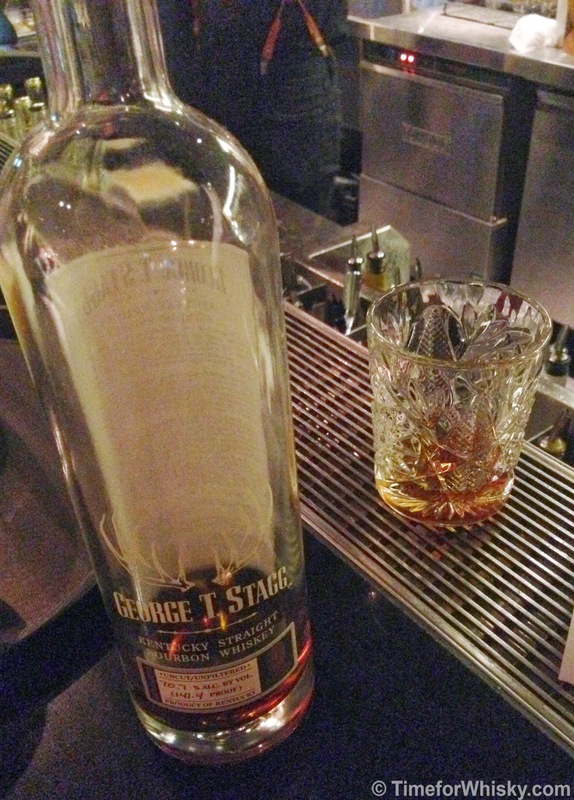 If you can find a bottle of Stagg in Australia it'll likely be between $300-$400AUD. ..which is why, when I saw it on the menu at Neutral Bay's The White Hart (one of our favourite LoNoSho bars) for something like $18/nip, I jumped at it. The pricing disparity on various bar menus around Sydney always amuses me. It's not uncommon to see a $150 to $200/bottle whisk(e)y for say $20/nip, whereas on the same menu something like Ron Zacapa 23 (which usually sells for $90/bottle) will sell for $23-$24/nip. Crazy. I get that different bars have different suppliers, allegiances to Diageo, Pernod, Brown Forman etc, but it's still always amusing. Still, I wasn't complaining. Here was a chance to tick off a #101drams whisky for relatively little outlay! Colour: Deep, rich, dark copper. They say the average age is 15 years and it's clearly taken on a lot of wood in that time. Nose: Rich, full, with a strong oak influence. Bananas. Palate: So smooth, yet so hot. Instant heat, but not a bad, harsh alcohol burn. Some very sweet maple notes, with hints of vanilla. A few drops of water (which you pretty much have to try with a whiskey of this ABV) didn't change the nose a lot, but exploded all the same notes on the palate, especially the vanilla. Finish: LONG. Vanilla, with hints of tropical fruit (pineapple predominantly) towards the end. Didn't expect that. Rating (on my very non-scientific scale): 93/100. A beast of a whisky, but certainly not unapproachable. A whiskey I'd happily drink again, and would consider buying if I found for a reasonable price (likely only in the US).